Vote ‘No’! For a mass working class campaign to oppose Troika and for socialist policies! 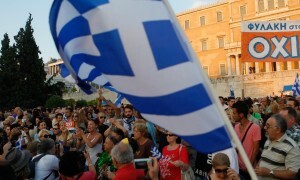 Events in Greece have thrown the entire Eurozone into crisis and threaten its very existence. Greek banks were closed on Monday after the European Central Bank (ECB) stopped the liquidity lifeline that kept Greek banks afloat during months-long run on deposits. As of the time of publication, it is in the balance whether Greece’s latest debt payment due to the IMF on 30 June will be made, making it more likely that Greece is heading for a default. 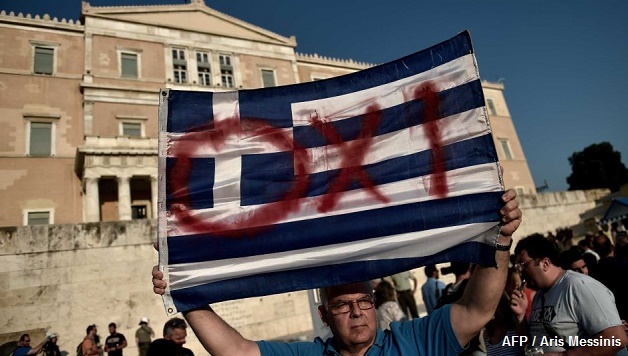 All this came after Greek Prime Minister Alexis Tsipras, on behalf of the Greek cabinet, called a referendum for 5 July proposing a ‘No’ vote on the demands of the creditors (ECB, European Commission and IMF). The Troika were also incensed by SYRIZA’s proposal to increase taxes on the richest in Greece and to raise corporation taxes. Even these relatively mild taxes were too much for the boss’s eurozone to stomach. 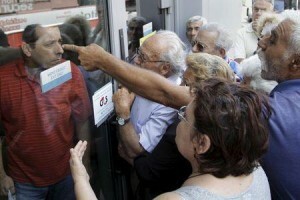 Some Troika spokespeople threatened that the referendum means the end, in effect, of Greece’s eurozone membership. But EU governments are also fearful that despite their much vaunted “firewall’ preparation for a “Grexit”, a forced departure of Greece will have incalculable financial, economic and political repercussions. Which country would be next to potentially follow Greece out of the euro – Portugal, Spain, Ireland, even Italy? On top of that, the Obama administration is also concerned about the economic and geo-strategic fall out of a Grexit. The White House is calling on Brussels to compromise to keep Greece, a NATO member, in the eurozone, less the Putin regime takes advantage of the situation. 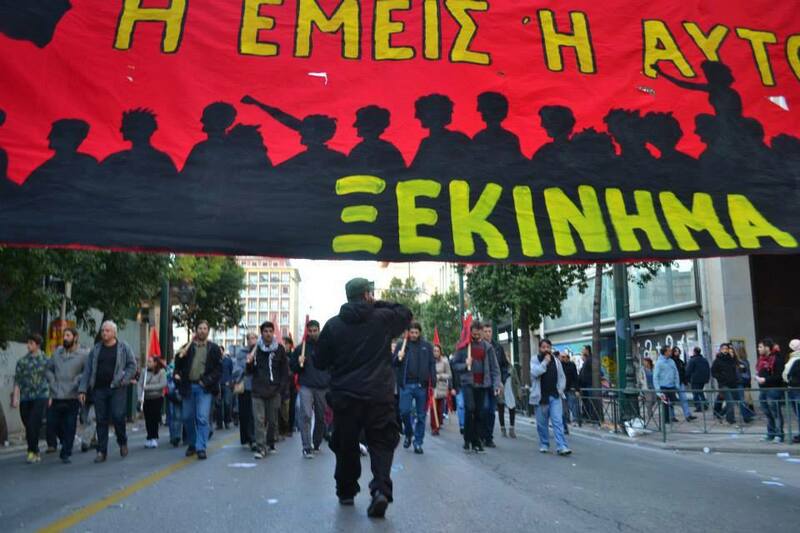 The CWI in Greece, Xekinima, has from the start of the SYRIZA government called on it to consistently carry out the anti-austerity mandate given to it by Greek voters. This means refusing to pay the debt, imposing capital controls against the markets, and nationalising the key sectors of the economy under democratic workers control and management. In light of the new crisis, the SYRIZA government should stop capital flight by seizing the property and assets of the big capitalists and companies. Instead Tsipras engaged in months of fruitless ‘talks’ with the Troika, which only wants to impose more of its anti-working class, austerity programme. This policy ended in failure. Xekinima called on Tsipras to walk away from the latest round of ‘negotiations’and to appeal to the Greek people; telling the truth about what is taking place in Brussels and explain that the “Institutions” are blackmailing the government to either accept a new memorandum of massive austerity or be kicked out of the euro. On this basis, SYRIZA should take a clear cut position of leaving the Eurozone and link this to a socialist programme to put back the economy on the path of growth and in the interests of the labouring people. As Xekinima explained, depending on circumstances, this could have been taken to the Greek people, through new elections, for example, and a bold, fighting position would have won a landslide. Unfortunately Tsipras once again refused to totally reject austerity and neo-liberal policies. In fact, the Greek government even added privatisation proposals which the Troika had not included on the list, including the sale of district airports. Tsipras called for a referendum on the latest Troika austerity package ‘offer’ and made clear that SYRIZA supports a ‘No’ vote, but made no positive proposal to the Greek people about what to replace the Troika’s proposals with. On the contrary, he never tires of saying that a ‘No’ vote is only a bargaining tool to force the Troika make more ’sensitive’ proposals to the Greek government. Capital controls should have been introduced in February and the banks immediately nationalised. While many Greeks see the vote as a way of allowing them a democratic say in events and a chance to hit back at the Troika, the referendum holds real dangers. The right-wing and mass media will spend this week trying to cajole blackmail and terrify Greek workers and the middle classes away from voting ‘no’. Better to stick with the devil you know (another Troika cuts package), they will threaten, rather than the devil you don’t (default and be kicked out of the Eurozone and possibly the EU, followed by further impoverishment). This can influence some Greeks but can also repel others even more. The SYRIZA leaderships’ policy is still one of negotiating with the Troika, rather than making a clear breach with the endless cuts of the boss’s Eurozone and introducing pro-working class, socialist policies. Tsipras hopes he can return to Brussels with a massive ‘no’ mandate and with a stronger negotiating position win more concessions from the Troika, including a debt write-down. But even assuming the Troika is still prepared to negotiate with SYRIZA after the referendum, any deal will still mean more austerity in Greece, further hitting working people, pensioners and the poor. There is a huge scare campaign already through the mass media controlled by the Greek ship owners, bankers and industrialists. They say there will be no money for pensions and wages at the end of the month. If SYRIZA continues not to present a clear plan of action and struggle, there is the threat that the campaign of fear launched by the ruling class could result in the ‘No’ vote being defeated. Notwithstanding these criticism, Xekinima (CWI Greece) has started a fully fledge campaign for a ‘No’ vote next Sunday. Around 150,000 leaflets and 3,500 copies of the new Xekinima newspaper are being printed this week. At the same time, Xekinima is heavily involved in the attempt to build ‘No’ rank and file committees in the neighbourhoods, bringing together different sections of the Left. Interestingly, ANTARSYA (Anti-capitalist Left Alliance) which traditionally has a sectarian approach towards the rest of the Left and SYRIZA in particular, is now energetically involved in this action. Unfortunately this is not the case with the KKE (Greek communist party) which has taken an absolutely sectarian approach, calling on voters to spoil their ballots (abstain). Given that the KKE still commands significant support amongst workers, this could help pave the way to a ‘Yes’ majority if the vote is close. A Yes victory would probably see the SYRIZA government fall and a new right wing-dominated coalition emerge that would be willing to make a brutal austerity deal with the Troika. But a ‘No’ vote on its own is not enough. A mass campaign on the streets and in the workplaces is needed to actively involve the working class in opposing the Troika. The huge Athens demonstrations called on 29 June by SYRIZA shows the potential for mass resistance. Committees of action in communities and workplaces can lead the struggle against the Troika. A decisive rupture with the Troika, refusal to pay the debt and nationalisations and a programme of socialist policies would win enormous support from the long-suffering Greek working class and middle classes. An appeal to the working class of Europe and especially the other indebted Eurozone countries like Spain, Portugal and Ireland to show solidarity action, including holding mass protests in their own countries, would get an immediate and powerful response. The only real alternative to austerity and the boss’s EU is a socialist confederation of Europe, on a free and equal basis.